The modular BusyBee Software Suite for DALOG Condition Monitoring Systems DAVIMO, DATOMO and DAMASTA offers users extensive possibilities of management, visualization, and evaluation of measured data. DALOG BusyBee is designed to clearly display many different measurement stations in one software. A cross-plant status monitoring of several industrial plants is provided in an extended module. The software is available as a server-client version as well as a single-user license. 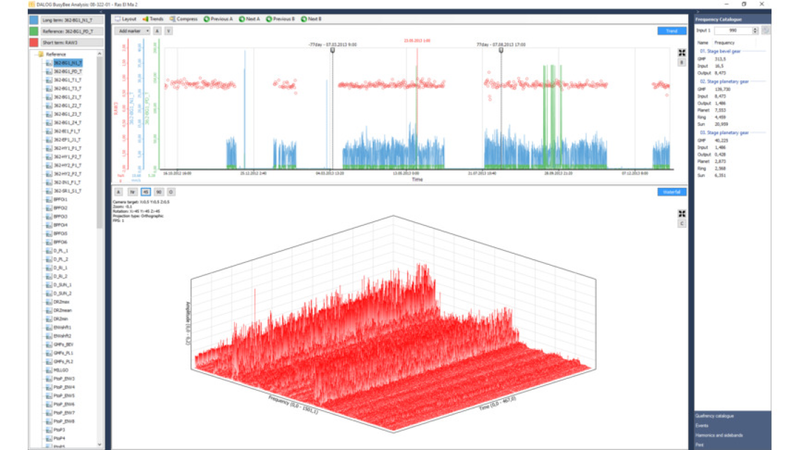 The offline analysis module includes features to eliminate interfering signals (noise), 3D FFT waterfall diagrams, cepstrum analysis and process analysis to name just a few. A dynamic frequency catalog allows an insightful analysis at variable speeds. All this makes DALOG BusyBee an all-purpose tool for production and maintenance manager, as well as regional division managers, for monitoring tasks ranging from single machines to entire production processes.